What happens when Awaken Training Series 1.0 comes to an end? For those of you who have experienced the benefits that 1.0 has to offer and have enjoyed the fresh look at training over these past 12 weeks, we have great news for you. Awaken Training Series 2.0 is a chance to continue the journey with us. (If you missed the 1.0 sneak peeks you can find them here). Proper periodization in athletic training programs requires that you circle back to the fundamentals. It would be a mistake to continually add volume and intensity, because this type of programming doesn’t give the body and brain a chance to properly recover and adapt. You will experience a new beginning with 2.0 when we start back with longer time under tension tempos and lower the intensity to kick off the first several weeks. The great news is that returning to the basics doesn’t mean regressing in your fitness. On the contrary, it is a chance for all the fitness gained during 1.0 to sink in more deeply to your nervous system, and for you to start applying that strength gained to new movement patterns. The intensity will return when the timing is right and by following this cyclical pattern we aim to keep you fresh, avoiding burnout, and continually loving your training. Utilization of long time under tension in the front squat for strength building is a fantastic way to not only build the legs and core, but also the upper back. Look for the super slow 55X1 Front Squat Tempo for sets of 5. That is almost 60sec of time under tension per set. Once we have built through the long time under tension progression for four weeks, we head into the one and one quarter front squats. Awaken Training Series 1.0 provides exposure to this as well. They are a great variation of the squat to increase the time under tension in the lower third of the squat range of motion. They also do a great job of targeting the anterior chain and firing up the quads. Single leg knee flexion is a hallmark of Awaken Training Series 1.0. From RNT Lunges to Step Ups, 1.0 had a lot of single leg squatting variations. We will continue those into 2.0 and add in a progression of single leg bending. Starting with both legs on the ground in this variation, keep the balance limitations to a minimum, while at the same time targeting one leg at a time over the other. 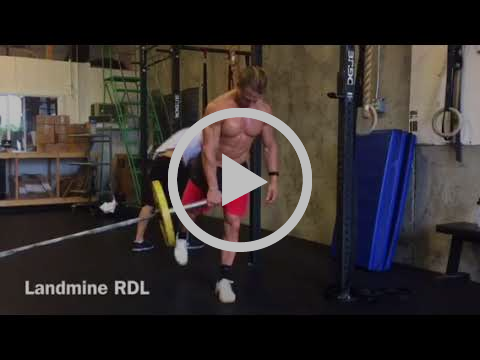 The single leg Landmine RDL works well to introduce single leg bending while also giving you a touch of stability with the landmine load. The landmine attachment helps provide a little balance. In this variation we remove the stability from the landmine and thereby increase the difficulty associate with balancing and hinging simultaneously. In Awaken Training Series 1.0 we work on building your absolute power in the Power Clean. In ATS 2.0 we will enhance your clean technique with complexes that will force you to slow down and pause at different points in the range of motion. Precision in the olympic lifts can only be built at sub maximal loads and complexes are a great way to keep the loads and %’s down so you can focus on the technique. ATS loves slow eccentric overhead lifting since it really places a huge demand on the triceps and helps athletes learn great shoulder packing practices, especially during the slow lowering of the load back to the shoulders. Pausing in the dip and pausing overhead in the catch position are two of the most effective drills I’ve ever used to progress my jerk. We combine those two pauses into a series of multiple weeks of Jerk practice. These two pauses will expose any balance issues that you may have or stability issues you have in your shoulders. Regardless of whether you have handstand push ups or not, if you have never tried this specific progressions then you are in for some improvements. By starting with slow eccentrics only we build stability and strength for wherever you are in the process of learning. 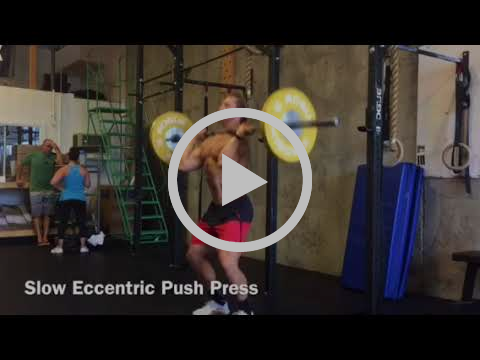 Negative Strict Strength First –> Concentric Strict Strength –> Dynamic Kipping Skill. This is a progression for upper body gymnastics we love to use for multiple movement patterns. If you have completed the 1.0 program, registration for Awaken Training Series 2.0 will be open April 1-8.